Nuclear fusion reactions sparked by beams of antimatter could be propelling ultra-fast spaceships on long journeys before the end of the century, researchers say. A fusion-powered spacecraft could reach Jupiter within four months, potentially opening up parts of the outer solar system to manned exploration, according to a 2010 NASA report. A number of hurdles would have to be overcome ― particularly in the production and storage of antimatter ― to make the technology feasible, but some experts imagine it could be ready to go in a half-century or so. Inside each pellet, this fuel would be surrounded by another material, perhaps uranium. A beam of antiprotons — the antimatter equivalent of protons, sporting a net electrical charge of minus-1 rather than plus-1 — would be directed at the pellets. When the antiprotons slammed into uranium nuclei, they would annihilate, generating high-energy fission products that ignite fusion reactions in the fuel. Such reactions — for example, deuterium and tritium nuclei merging to create one helium-4 atom and one neutron — throw off huge amounts of energy that could be harnessed to propel a spacecraft in several different ways. "The energy from these reactions could be used to heat a propellant or provide thrust through magnetic confinement and a magnetic nozzle," states the 2010 report, called "Technology Frontiers: Breakthrough Capabilities for Space Exploration," which NASA produced with the help of The Tauri Group and other experts. The basic idea is not new: Project Daedalus, a study conducted by the British Interplanetary Society in the 1970s, proposed using a fusion rocket to power an interstellar spacecraft. Daedalus' fusion reactions would be sparked by electron beams rather than antiproton beams, however. The Daedalus spacecraft's spherical tanks contain the fuel pellets for the nuclear fusion engine. While antiproton-driven fusion is a promising technology, several obstacles must be overcome to make it feasible, Hay said. Perhaps the biggest challenge is obtaining enough antiprotons — which can be produced in particle accelerators — and storing them for long enough to make a far-flung space journey feasible. According to the "Technology Frontiers" report, about 1.16 grams of antiprotons would be required for a trip to Jupiter. That may not sound like much, but production levels are currently measured in the billionths of a gram. "Antiprotons are extremely expensive; a few grams would cost multi-trillions of dollars," Hay said. "I believe the total production so far since the 1950s is on the order of like 10 nanograms." But antiproton production is ticking upward at a fairly fast rate, he added. 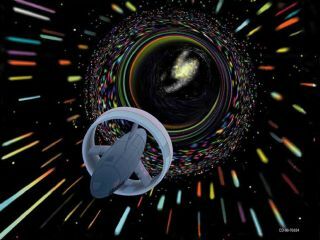 So perhaps the technology could be the next big breakthrough in space propulsion systems — in the year 2060 or so. "With a steady supply of antiprotons and nuclear fuel, antiproton-driven fusion can provide abundant energy for large space stations, outposts, and extended exploration missions with relatively small power systems," the "Technology Frontiers" report states.